Hello stampin' friends! I made a little time to get crafty this afternoon and thought I would play along with two of my favourite challenges. 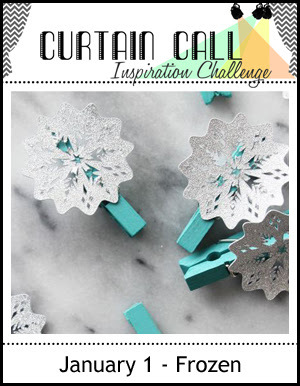 The Curtain Call Inspiration Challenge January 1 - Frozen and Freshly Made Sketches # 217. When I saw the pretty snowflakes I just knew I had to use my Reverse Confetti Layered Snowflake Confetti Cuts. It was perfect for Curtain Call Inspiration Challenge and the great sketch that they have at Freshly Made Sketches # 217! I took inspiration for the colour scheme from the Curtain Call inspiration photo and used MFT Heavyweight cardstock in Grout Grey, Blu Raspberry, Steel Grey, Sweet Tooth and Sno Cone. I cut the large tag with the RC Gift Card Holder Tag Confetti Cuts and stamped the sentiment from Peacock Pretties Stamp set and embossed it with Zing White Embossing Powder. The snowflake is made with the Reverse Confetti Layered Snowflake Confetti Cuts. I tied the tag with some Hemptique hemp cord, added a sprinkling of Sparkly Silver YNS Gumdrops and thought I would clip on a a tiny clothespin from my stash; inspired by the Curtain Call Inspiration photo. I finished off the inside of my card too and stamped and embossed the sentiment from the Reverse Confetti With Love Sentiment Stamp set and added another little snowflake cut with the Reverse Confetti Layered Snowflake Confetti Cuts. Thanks SO much for stopping by and having a little peek at my card for the Curtain Call Inspiration Challenge January 1 - Frozen and the Freshly Made Sketch # 217! Beautiful card, love the colours you have used. Just looking through your wonderful creations, love that you do such wonderful cards inside and out. I'm in Australia, hearing impaired, deaf daughter and sign language users both. Great colors - love the added sparkle! Pretty card! Glad you joined us at FMS! This is so adorable. 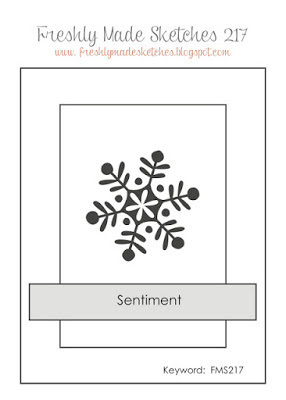 I love the layered snowflake and how it's arranged on the tag. What great colors and so many details to love! Thanks for playing along with us at Freshly Made Sketches! This is just gorgeous! Love that pretty snowflake! This is just gorgeous! I am loving all of those fabulous details! Thanks for joining us at FMS! Oh, the are both fabulous! I love your take on the inspiration photo! Another winner! I love the turquoise accents on the snowflake. oh, Tara! this is soooo, so sweet! Love how you used the colors from curtain call and of course the wonderful RC snowflake. this is so pretty! thanks for playing along. 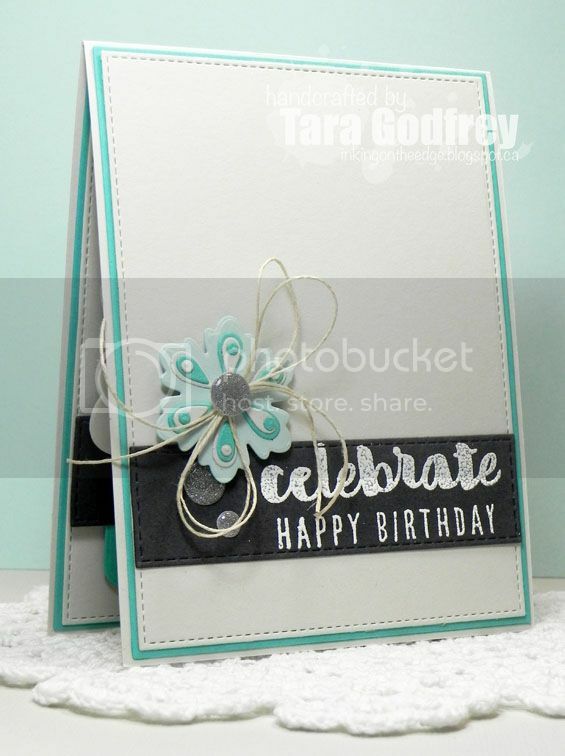 Beautiful use of that die - LOVE the color scheme - and so pretty on the inside too!